Reflective insulation systems are usually made from aluminum foils with a variety of backings such as roof sheathing, kraft paper, plastic film, cardboard, etc. The resistance to heat flow depends on the direction of heat flow with this type of insulation most effective in reducing downward heat flow and requiring an air space next to the reflective side. Reflective systems are usually located between roof rafters, floor joists, or wall studs. Reflective insulation placed in walls or on the attic floor must be perforated to allow water vapor to pass through it. If a single reflective surface is used alone and faces an open space, such as an attic, it is called a radiant barrier (sometimes called radiant heat barrier). 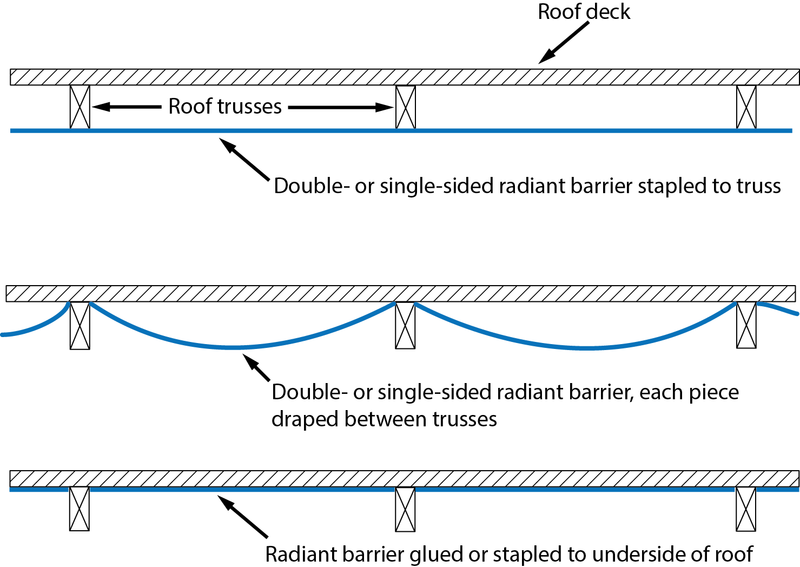 Some radiant barriers have a reflective surface on both sides so either side can face the open air space. Properties to look for are high reflectivity and very low emittance (the energy radiated from the material’s surface), which enable it to reflect the radiant heat energy and give off (emit) very little. Radiant barriers are most effective in blocking summer radiant heat gain and saving air-conditioning costs. Although the radiant barrier may be somewhat effective in retaining heat within a cold-climate home, it may also block winter radiant heat gain in the attic. What is radiant heat transfer and why are radiant barriers effective? Radiant heat transfer occurs when electromagnetic waves travel in a straight line through a vacuum or air between surfaces that are at different temperatures, heating any object in its path. The earth receives all its solar heat through radiation. Dark, rough surfaces will generally absorb radiant heat and become warm, while smooth, shiny surfaces will reflect the radiation. This is why radiant heat transfer can be limited by the use of radiant barriers, which have shiny foil surfaces. Will I still need insulation if I use a radiant barrier? Conventional types of insulation consist of fibers or cells that trap air or contain a gas to primarily retard heat conduction, and, to a lesser extent, convective air flow at various rates. On the other hand, radiant barriers and reflective insulation systems work by reducing radiant heat gain. The R-value indicates the resistance to heat flow. The higher the R-value, then the greater the insulating power. Radiant barriers reduce only radiant heat transfer though, so the rules as applied to determining R-value of the products relate to not only the thickness of the material but how it is installed. See Section 460.12 of the Federal Register for details. Therefore, due to the way heat is transferred, you still need insulation. The amount of thermal insulation affects the potential radiant barrier energy savings. For example, installing a radiant barrier in an attic that already has high levels of insulation (R-30 or above) would result in much lower energy savings than in an attic insulated at a low level (R-11 or less). What is the effect of radiant barriers on heating and cooling bills? According to the Oak Ridge National Laboratory, your savings on heating and cooling bills will vary depending on a number of factors. These factors include: type of radiant barrier application, size of your house, whether your home is a ranch style or a two story house, amount of insulation in the attic, effectiveness of attic ventilation, color of the roof, thermostat settings, tightness of the building envelope, actual weather conditions, efficiency of the heating and cooling equipment, fuel prices, etc. The document, Radiant Barrier Fact Sheet, includes a link to the Radiant Barrier Calculator that includes simple calculations on how to approximate the economics of radiant barriers and added ceiling insulation. The calculator is part of the fact sheet but, for convenience, this is the direct link. How are radiant barriers installed? A radiant heat barrier must have an air space next to a reflective side to be effective. If you do not allow for this air space, the radiant barrier acts as a conductor and just passes the heat along from a hot surface to a cooler surface. Therefore, if the material you purchase is reflective on only one side (has only one “shiny side”), this side should be facing the air space. It cannot be sandwiched between two materials, as the air space is critical to its performance. They should also be installed to prevent dust build-up as dust and dirt will decrease their effectiveness. Attached to either the faces or bottoms of the rafters or top chords of the roof trusses (this method can also be used in existing homes). Draped over the rafters or trusses in a way that allows the product to droop (i.e. hang loosely) 1½ to 3 inches between each rafter. Attached to the underside of the roof deck (sheathing) with the foil side facing the air space or attic space. Be fabricated over a ceiling insulated to a minimum of R-19 with conventional insulation. Be installed to cover gable ends without closing off any soffit, gable or roof ventilation. Installation methods differ depending on the individual home, with issues such as dust and/or possible moisture accumulation, locations of bathroom/kitchen vents and recessed lights, safety, visibility of roof components, attic accessibility, etc. You will have to do further research to determine the best option for your home. Federal Register. (2005). Part IV, Federal Trade Commission. 16 CFR Part 460 Labeling and Advertising of Home Insulation: Trade Regulation Rule; Final Rule. Florida Building Code 5th Edition (2014) Residential. Accessed May 22, 2015. Miller, C., Sullivan, J., and Ahrentzen, S. (2012). Energy Efficient Building Construction in Florida. ISBN 978-0-9852487-0-3. University of Florida, Gainesville, FL. Oak Ridge National Laboratory. (2010). Radiant Barrier Fact Sheet. United States Department of Energy. (2012). Radiant barriers. Authors: Wendell A. Porter, lecturer and P.E., Department of Agricultural and Biological Engineering; Craig R. Miller, senior associate in, Program for Resource Efficient Communities; and Kathleen C. Ruppert, Extension scientist, Program for Resource Efficient Communities, Florida Cooperative Extension Service, Institute of Food and Agricultural Sciences, University of Florida, Gainesville, FL 32611. First published May 2009 and revised May 2015.